We present to you the top 10 best Android apps of November. With all the new Twitter and running apps, it's a good month. Zagat to Go: Oh, you know what this is. 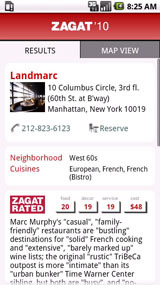 Zagat's mobile app for Android has the usual deal, which is listings and reviews for over 40,000 restaurants, hotels and other stuff like that—different from its somewhat limited compass app, Zagat nru. Zagat's listings, unlike Yelp's, aren't free, so the app's 10 bucks on the Android Marketplace. 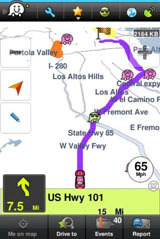 Waze: A turn-by-turn app that doubles as a real-life rendition of Pac-Man as you race—again, in your actual car—to collect treasures placed at intersections on the map, though your car doesn't turn different when it rolls over a mysterious ball of white stuff. The point? For instance, if there's an area where we detect a disconnect in two streets on the map, we'll place a goodie over there in what we believe is the point of intersection. Then, when someone heads over to munch the 'goodie', it will solve the disconnect, telling the waze system that these two streets do indeed intersect. Adobe Photoshop Mobile: I think I said it best earlier: "Photoshop! On Android!" 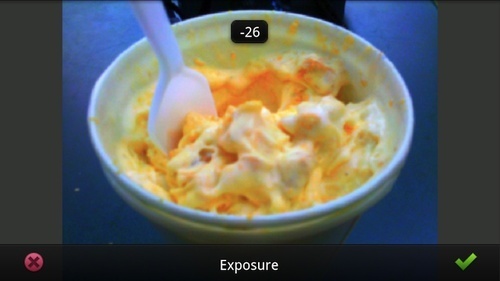 The app is slick, if a little limited—where's the white balance adjustment or special effects from the iPhone?—but if you're just tweaking basics like exposure and saturation, it'll do you just fine. It's free. AddressBook: Don't have Android 2.0, Moto Blur or HTC's Sense UI, but want all of your contacts' different social network profiles integrated seamlessly in your address book? Asurion's AddressBook is the ticket for less fortunate individuals like yourself. It integrates everything you'd expect like Twitter, Facebook, Flickr, but aims to deliver richer info than most of the other integrated address books like it, with better and more customizable filters. More than that, it's extensible, with features like local search, and the ability for other developers to tap into it. It's free. Seesmic: If you hate Twidroid's interface or the bizarrely missing features in the free version—like bit.ly support—Seesmic's new app is probably what you're looking for, as the nicest Twitter app on Android. As a version 1.0 release, it's not uberpowerful, but with features like direct YouTube video uploading, geolocation, and a really clean interface (for an Android app), it's got enough to be my new default Twitter app on Android. Fring: The multi-protocol IM app that we like on the iPhone is now on Android, with full support for Google Talk, Skype, MSN Messenger, AIM, ICQ, Twitter, Yahoo and yes, VoIP calling. It's free and looks fantastic on the Droid's high res screen. AP Mobile: It's a news app, but you know, from the Associated Press. You've got your choice of stories, photos or videos, and it'll dump breaking news and alerts in the background. Freeee, and remember that when news goes out of business. Slacker: Everybody's other favorite internet radio service, Slacker's finally on Android, late to the party after Pandora, naturally. Graphically, it looks kinda assy on the Droid, and supposedly has been having crash problems on the Droid Eris but I like its stations a lot. 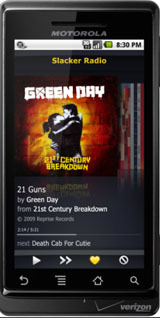 It's free, unless you decide to pony up cash for no ads and unlimited skips. runstar: A frankly gorgeous running application—no really, it might be the most beautifully designed Android app I've ever seen—that turns running into a social network game, with goals and competitions against your friends, along with everything else you'd expect from a running app, like different kinds of runs, full stats tracking and a built-in music player app. There's also a "power up" mode that switches up the visuals and plays your starpower song. Did I mention it looks amazing? It's free.